You are here: Home / Blog / Which Roofing Type Is Best For A Steel Building? When planning for your steel building it is important to consider the type of roof the structure will have. The roof is a very important part of any steel structure, as the roof’s design affects the cost of your building, the amount of interior space, energy performance and the aesthetics of your building. The are several options in roof shape, finish and accessories which we will discuss below. The shape of your structure’s roof depends upon the overall design of the building of if it’s a metal building kit. 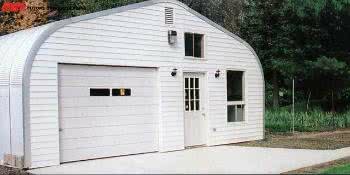 For owners who are purchasing an arched building, also known as a Quonset Hut, the building’s roof will also be arched. For structures with straight walls the roof will also consist of flat panels. Arched buildings are less expensive than straight wall buildings and also provide superior support and protection against the elements. Arched buildings are ideal for areas with tornado or severe storm concerns. Traditionally arched buildings have three roofing options: the Q-model, S-model and the P-model, each with slightly varying degrees of slope. However, some steel building owners prefer the look and shape of straight wall structures. These buildings still provide excellent support and endurance while maintaining a more traditional appearance. Depending on the structure of the building itself, roofs can consist of two straight panels on either side, which meet at a peak in the middle of the building, or a sloped roof, which consists of one straight panel in an upward slope across the entirety of the building. With flat paneled roofs owners have the ability to select the desired pitch, or degree of slope that the roof has. Roof pitch is defined as a ratio, which compares the vertical height of the roof in inches for every 12 inches the roof runs horizontally. For example, a roof pitch of 4:12 means the pitch of the roof rises 4 inches for every foot it runs horizontally. There advantages and disadvantages to both higher-pitched and lower-pitched flat roofs, which both impact the performance of the building as well as the structure’s cosmetic appearance. Higher-pitched buildings tend to blend in more with surrounding residential and office buildings and may be a great option for steel homes. Higher pitched buildings also increase the maximum clearance of your building creating more interior space. For owners who are looking for additional storage in the eaves of their building a higher-pitched roof is an excellent choice. If your building will exist in a warmer climate, or will not have air conditioning, a higher sloping roof helps disperse heat within the building, helping keep temperatures low. As mentioned above the visibility of your roof may affect the finish you select. 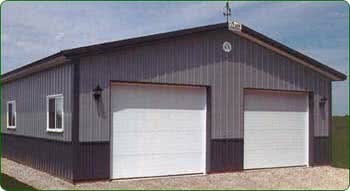 Most all steel buildings come standard with a GALVALUME® roof. A GALVALUME® roof consists of a sheet of steel with 55 percent clear Aluminum-Zinc alloy coat. This protective coat is specially designed to handle the most extreme conditions, including inclement weather such as storms, rain and snow as well as consistent exposure to heat and sun. Since the Aluminum-Zinc alloy coat is clear the silver steel underneath is visible on a GALVALUME® roof. The average GALVALUME® panel comes with a 20 year warranty. For owners who wish to make cosmetic alterations to their buildings there are several paint options for your roof. Painted roof panels are a more expensive option but buildings with painted roofs are often aesthetically preferable as they appear more finished, and blend in better with surrounding structures. The color options will depend upon the specific supplier of your steel building but the most common options are variations of red, blue, green, gray and tan. However, be sure to ask about warranty options before deciding upon a color for your roof. While most painted panels are coated with a Silicon Polyester-based paint and include a 25 year warranty, some color options are significantly less durable and may carry as few as a five year warranty. There are many options when it comes to accessories for your roof, including skylights, and gutters and down spouts. These accessories can help protect your building as well as increase its energy efficiency. Learn more about building accessories for your custom horse barn. Skylights, referred to as rooflights on steel structures, are both a cosmetic and practical enhancement. These rooflights are often made from translucent fiberglass inserts, or if something stronger and more durable is required polycarbonate panels are used. These rooflights greatly add to the natural light present in your steel building, cutting down on the energy costs required to light a building. Rooflights also help with heating costs as the natural light can help heat your building. The number of rooflights that can be inserted in a roof is determined by the spacing and arrangement of the roofing panels, but oftentimes rooflights comprise about 20 percent of the total square footage of the roof. In areas with high amounts of rain and snow owners may consider attaching gutters or down spouts to their buildings. These options are available only on straight walled buildings and help divert precipitation off the roof and away from the walls and foundation of the building. Down spouts can also be adjusted to divert runoff in a certain direction which is more beneficial based upon the surrounding terrain.